Visiting Nepal? Nepal offers a wide area of travel opportunity from the infamous treks in the Himalayas torich diversity of local culture, breathtaking natural fauna and flora. No matter what your purpose is for traveling to Nepal, staying in Hotel Manaslu, Lazimpat will be one of the highlights of your trip to Nepal. Experience Hotel Manaslu to experience Kathmandu! Hotel Manaslu is a boutique hotel built embracing the traditional Newari architecture and serving Nepali hospitality. 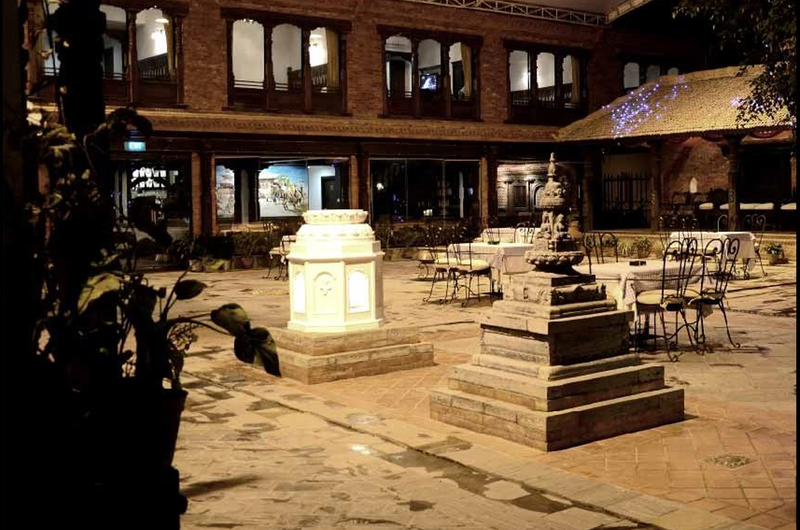 The hotel premise constitutes of different traditional Newari aspects such as the Chaitya, Chiri, traditional stone tap, Newari wooden windows and pillars. Hotel Manaslu provides you all the modern amenities while bringing you closer to Nepalese heritage through its architecture and cuisine. Hotel Manaslu will help you connect with the essence of traditional Nepali culture and tradition. Whether you are in Nepal for business or pleasure, Hotel Manaslu is perfect for you. It is situated in the central part of the Kathmandu in the Lazimpat area, which provides easy access to all the things you require for your trip in the country. Hotel Manaslu is within 15 minutes drive from the airport, 15 minutes drive from the UNESCO World Heritage sites of Swayambhunath, Pashupatinath, Boudhanath, and Kathmandu Durbar Square. It is within 10 minutes walk from the vibrant tourist area of Thamel. Hotel Manaslu is within walking distance of French, Indian, British, American and Danish embassies. The concentration of embassies has resulted in a wide array of different society and the area offers a number of great restaurants serving different tastes of people. Both local and foreign populace turns up in Lazimpat for fine dining experience, Junu Restaurant in Hotel Manaslu being one. With the hotels intricate and traditional woodwork you can catch a glimpse of whats Kathmandu has to offer in terms of architectural masterpieces of bygone era. And talking about accommodation in Hotel Manaslu in Lazimpat, every single room is simply wonderful. Each one is furnished in an elegant fashion with a traditional touch to them. After an exciting outing in the city, you will want to take a day off. So what can you do? Stroll around the garden for fresh air and watch colorful Kalij and if you happen to be lucky, you can see them even dance. Refresh yourself with a dip in the cool swimming pool in the hotel or simply relax in your beautifully decorated room. You can have rendezvous in the hotels restaurant or the peaceful Cafe Kutang in the hotel premise. You can lounge in the cafe reading a book, finishing your work or just chat with friends while sipping coffee or beverage of your choice. And what do you know? You will definitely want this after one of the exhilarating treks in the Himalayas! Let go and unwind in the serene environment of Hotel Manaslu, Lazimpat. If you happen to be in a hurry with no time to take a trip in the city to get some souvenirs for your friends and family, Hotel Manaslu has got you covered. A quick dash to the hotels gift shop will leave with bags full of traditional and exquisite souvenirs to take back home. Besides the impeccable service and facilities offered by Hotel Manaslu, the location of the hotel gives you an easy access to anywhere you want to travel in the city. A 5 minute walk will leave you standing at the doorstep of Trisara, and Vino Bistro, just two of many high quality wine bars in Lazimpat. Venture out in the local eateries offering tasty treats within the heart of Lazimpat. You can visit any of the bars and restaurants in the area to dine on some of the fine cuisines, from local delicacies to continental, you name it. Its all here. You can just stroll down the street for 10 minutes and you will find yourself in Thamel, the tourist hotspot in the capital. Spend a couple of hours exploring the area known for attracting tourists, backpackers, businessmen. Simply put everyone from all walks of life. You will find a variety of shops here in Thamel catering to tourists and trekkers. Their products ranging from traditional artifacts to trekking gears, expensive as well as cheap restaurants and bars, foreign money exchange, travel agents, clothing items, souvenirs and much more. Just be on the lookout and you will find things you will love. If you love some good music, go for musical restaurants in Thamel to have food and great music. Like they say – Kill two birds with one stone. Because Hotel Manaslu is located in Lazimpat, you can take short trips to the capitals cultural heritage sites such as Kathmandu Durbar Square and Patan Durbar Square. And for a little trip further in the city to Bhaktapur and Kirtipur to immerse yourself in the architectural and cultural splendor. There are many short hikes around the capital that you can go for if you are looking for some adventure closer to nature. Get ready to strap you boots for day hikes to Champadevi, Phulchoki, Shivapuri, Nagarjun just to name a few. And if you havent had the fill for adventure, go for white-water rafting in Bhotekhosi River or Trishuli River. While you are in adrenaline rush, you might want to check out bungee jump in Bhotekhosi Riveras well that is a few hours drive out of Kathmandu. Hotel Manaslu can arrange the trip and/or transportation for you, you only have to ask. A stay in Hotel Manaslu, Lazimpat gives you an opportunity to explore more of the Kathmandu’s charm, tradition, architecture and heritage. And there will be no shortage of interesting things to keep you entertained!